As I begin to write this post I am not actually feeling all that happy. I struggle a lot with knowing what is OK to feel, think, do, what won't make me look insane is "normal". I struggle with letting myself feel blechy or blah sometimes because I am typically positive, and I worry that if I give in to the negative feelings even a little, I'll give over to them completely. It's a slippery slope, no? Our lives are in limbo, yet life still goes on....we have to go on with it, especially because of the kids, yet it feels forced and fake. Dealing with crap like car insurance and the kids' tutoring is like WHATEVER. I care about my house only so that it's livable and presentable. I really just want to blog, read, tweet, play my little games, knit or crochet, watch TV, take care of whatever my kids need, hang with my people...and process. I resent the logistics of life. Like so many things, it's about finding the balance. And I have faith that I will. Again. I think for the first time EVER, I may actually be looking forward to summer vacation! I do have a couple of small things that brought me happiness this week, however. 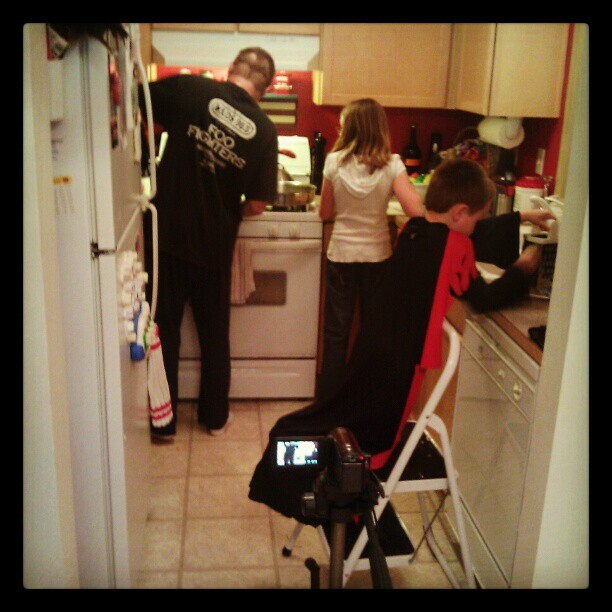 Mark and Camryn (AJ as sou chef), starring in their very own cooking show! Draw Something is so fun except super frustrating when I can't figure out what the hell someone drew and now that it's on my Kindle, it's so easy to SEE and so much easier to draw on the bigger screen. Speaking of little things, I have a box you can type an "interview" question in for my 2 year blogoversary post HERE. Ask me something GOOD! I obviously need some HAPPIER people around here! and link it the hell up! i love the cooking show! Please tell me he is wearing a cape? My son? He's wearing a Halloween costume! The blah days are so totally normal - and needed in my opinion. I think it's our body and mind's way of making us slow down so it can have the time and space to process everything and even just take a break sometimes. I say, take a day or heck, the whole weekend to do exactly what you wrote; blog, read, tweet, play little games, knit or crochet, watch TV, take care of whatever my kids need, hang with my people...and process. I am working on not feeling guilty when I take those days out to kind of disconnect and just do what feels right because really, I think it's good for us and there is nothing to feel guilty about. We emerge stronger and ready to face another day :) Have a great Friday Jen and happy TGIF! This makes complete sense, but so hard to DO! I know how you're feeling. It's the same over here. Not unhappy but not woohooo, happy! I think it's normal to get blah about the monotonous stuff about life. I linked up for TGIF finally!!!! You think our weather has anything to do with it? Are we going to get to see the cooking show? I'm sorry I can't give you any happy, it is a slippery slope and trust when I say you don't have to have anything major going on to question your own sanity. You will get to the place of balance, it's a revolving thing and you seeing all those little things is the best thing you can do until you get there..
You *might* get to see the cooking show *if* Mark ever gets around to editing the video! See, truthful and good. Great post and I'm glad you kept it all in there. I love playing Draw Something with you! We'll make it to 100 this time! I may have to look into this Draw Something--although I don't really need another thing to eat up my time. It doesn't have to take up more time. You can do it when you have time, like waiting for something... It's fun! Me too. We have to see how it turned out. They're heads might have been cut off. I often feel "meh". It's a cycle...all I want to do is read, and then I feel bad because I haven't done anything else, so I retreat to a book, which just makes me feel worse. Hope things brighten up for you soon! It helps me so much to know I'm not the only one.